Triple Layers of Black, Red and Merry Penguins dancing around. 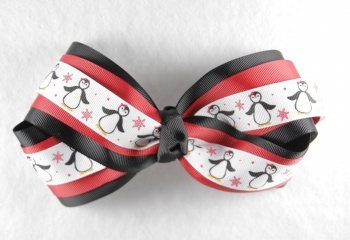 The base bow is a 2.25" black grosgrain ribbon, lined with a red 1.5" grosgrain ribbon, and then topped with a 7/8" white with dancing penguins and falling snowflakes. The penguins are black and white with orange feet. The snowflakes and penguin's bow is red. You get 105" of ribbon with this bow!. The center is wrapped with black grosgrain and it is attached to a French clip. Let these Happy Feet dance to your favorite Holidays songs, they will look great with all of your Holiday outfits.